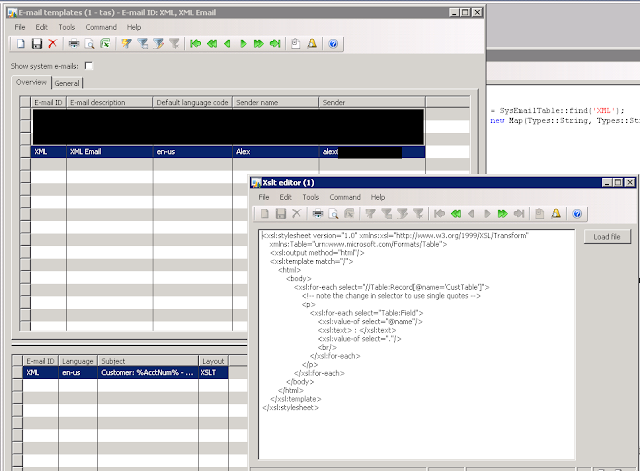 I've been asked recently about how to send emails using an XSLT with AX for formatting and sending XML data. I must admit, I had to visit StackOverflow for some XML pointers (credit Jason Aller). This example will show you most of what you will need so that you can customize it to your own needs. I will be dumping a few customer records to email with HTML formatting. In my subject, I put "Customer: %AcctNum% - %AcctName%" so that I could demonstrate how you can still pass mappings. Hope this helps and as always, happy DAX'ing!